1. Cook the rice noodles in a pan of boiling water for 5 minutes, drain well and then cool. 2. Mix together the wasabi powder and 1 tbsp warm water. Stir in the lime juice, soy sauce and sugar and set aside, stirring occasionally until the sugar dissolves. 3. 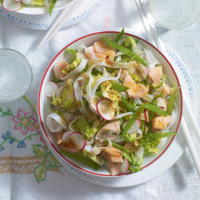 When ready to serve, toss together the trout (removing any small bones), rice noodles, mange tout, radishes and lettuce. Divide between bowls, drizzle over the wasabi dressing and serve. If the noodles start to stick together while draining, rinse with cold water to loosen them. Try an aromatic Pinot Gris from Alsace withthis dish: Cave de Beblenheim Pinot Gris Réserve, Alsace, France.